Box trucks are common sights on local roads. They make the transportation of tools and supplies a snap. Also, they are small enough to allow for street parking in front of a business’ location. 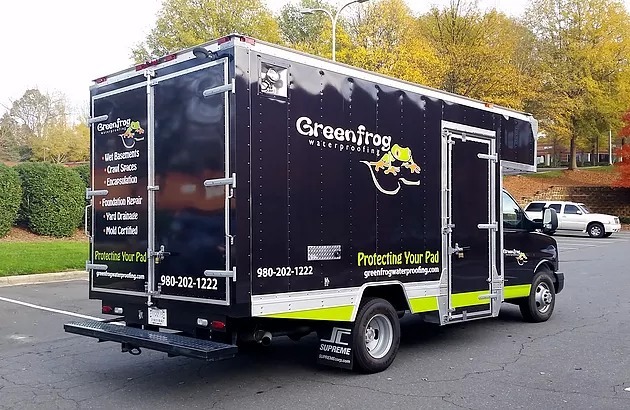 When you are ready to show off your branding and marketing messages with box truck graphics in Charlotte, NC, our graphic artists can help. The background of the box truck is black. At the bottom, a borderline neon green stripe catches the eye. The company’s name appears in white, whereas the logo is stylized with multiple colors that echo the green of the stripe. Contact information and the company’s tagline make up the side displays of this setup. On the back, the company’s representatives asked our technicians to display details of their services. Again, contact information rounds out the look. What makes this design work so well is the color contrast. It is impossible for this truck to roll down the street without folks taking notice. Since the bright green catches the eye, the tagline is usually the first thing consumers see. Its unusual tenor, “protecting your pad,” succeeds at piquing the interest. The rest of the information then provides answers to the questions that have formed in the prospective customers’ minds. ABS Insulating relies on a white box truck. Its name display features blue and black borders. This design allows the white on white lettering to pop. The company’s management team opted to display its niche, contact information, an American flag and its longevity in the business on the side of the truck. A large corner display features a spider web. What does a spider have to do with insulation? Everything, when it refers to Spider Insulation. By co-branding with a known manufacturer, ABS Insulating succeeds at creating product awareness in customers while turning heads. After all, who displays a spider web with a commercial box truck graphics package? Like many other companies, Shealy opted for a minimalist approach to marketing and branding. Blue on white lettering displays the company’s name and logo. Frequently, the absence of distracting information can make the presence of the graphics that are installed far more noticeable. The trick here is to go for size. Since this company uses larger box trucks, the idea of showing off a large advertising message makes sense. Do You Have Questions about Truck Graphics? Contact our professionals to discuss any questions you might have on box truck graphics in Charlotte, NC. We work with you or your management team to discover display options that show off your company’s information to its fullest advantage. In addition, we provide you with suggestions that can help you visualize the look of your truck after the treatment. Whether you are in charge of a fleet of box trucks or have one vehicle to treat, our graphic artists look forward to working with you. Contact us today to get started on the project.